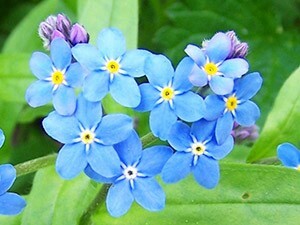 The Wasurenagusa, is a lovely bright blue, such as forget-me-not flowers. With the new color name from the Meiji period, derived from the legend of the German “Forget-Me-Not” Japanese translation. Been “Wasurenagusa” is the introduction of the German poet Wilhelm Arendt in Ueda Satoshiyaku “Kaichouon”, it is also said to have become as flower name, to be known as the name of the color. Forget-me-not is, a kind of purple forget-me-not family genus. Europe is at the origin, and give it a thin blue florets from spring to summer. Was loved by the people as a mysterious flower from that blue flower is small in Europe. Legacy was the Meiji era to this flower is Japan. At present we are gregarious in Japan and wild. Also it is grown for ornamental purposes, Himemurasaki, both Rurikusa. By the way, ancient Wasurenagusa genus Japan is only a kind Ezomurasaki. Forget-me-not flower is also said to be lovers of flowers, on the day of the one-time leap year leap year every four years in Europe, seems to be a habit of lovers each other gift this flower. The color of such a flower named after attributable to “Wasurenagusa”, as likened to a beautiful Eye Color, not might be a man of deep longing of symbolism.